A promising start for debuting leading man Michael Worth. He plays Danny, a young wannabe kickboxing champ’ who takes martial guidance from the washed-up former big-shot, Nick Taylor (Lorenzo Lamas). Nick uses Danny as a ploy to seek revenge for losing the title, his wife and his pride to the reigning pugilist Jake Gerrard (why is there always a character called Jake in these movies?). His inner demons unravel when they arrive in Vegas for the big championship showdown. 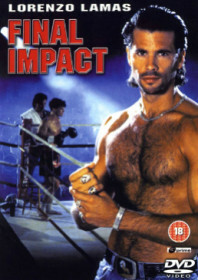 All the female characters appear to be swimwear models, and the film is rife with greased-up torsos; one of which belongs to the great Gary Daniels, making an early appearance as a guest fighter. It may be honkingly predictable, but the chemistry between Lamas and Worth is convincing, whether they’re talking strategy by the pool or sitting at the blackjack tables in Vegas. There is also a troubled romance at the heart of the film between Lamas and Kathleen Kinmont’s character which also works.